How cool are these? I know if I were a kid, I’d be dozing my peas into my mashed potatoes, and then fork-lifting them into my mouth. 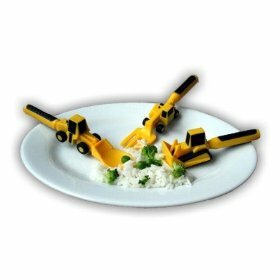 The set includes a “fork lift” fork, “front loader” spoon, and “bulldozer” pusher. They even have a special construction plate available with different work zones.